Ever since I was a wee babe, one song made me spontaneously burst into tears — Brahms’ Lullaby (“Lullaby, and good night,” etc.). My parents first discovered this because the mobile above the crib played it, and every time they wound the infernal thing up, I’d shriek until it stopped. For at least the first 20 years of my life, just a few notes of Brahms’ Lullaby would draw a convulsive wet snurk from my face. My brothers loved this and would miss no opportunity, ever. In the middle of a long, quiet car trip, Older Brother would quietly hum the first few notes so only I could hear, and I would thump him, and I’d get in trouble, which was So Unfair. Even worse were the times Younger Brother made me cry, which disrupted the whole Order of Things. Worst of all was the fact that I didn’t know why it did that to me. It was bizarre. Barber’s Adagio for Strings (as I may have mentioned) also makes me cry, but that one slays me gradually for reasons I can explain. The Brahms was always immediate and impossible to account for. My family advanced various theories, my favorite of which was that I was the reincarnation of Brahms’ wife and I missed him. But if that were the case, I figure the Academic Festival Overture would also choke me up. I’m over it now, mostly, but I never stopped wondering what that was all about. I even tore apart the theory of it, which in this case was like tearing into tissue paper: it’s all I and V and IV with nothing more adventurous than a couple of passing tones in the melody. Shocking modulations and searing appoggiaturas are pretty thin on the ground in lullabies. I like that idea, but I suspect being bothered by the UTM requires a level of emotional registration that was still in my future at that point. And though I’d have put my figured bass harmonizations up against any other toddler in South St. Louis in 1965, my motivic analysis was still sub par. And then, a few days ago, more than 50 years after first blood, I suddenly solved the musical mystery of my life. The answer was so obvious that I’m a little embarrassed, especially since you figured it out in the first paragraph, didn’t you. My parents would wind up the mobile, start the tune, and then leave. That has to be it. 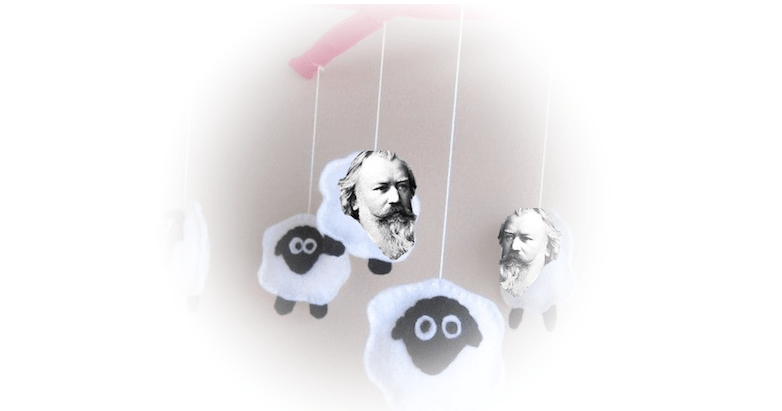 Brahms’ Lullaby was my soundtrack of abandonment. As I cried, that melody tinkled above me. Later, I’d hear the tinkle and the tears would flow. This would have been solved 30 years ago if I’d stuck with the psych major, but I went into music theory. So like the guy who looks for his wallet under the streetlight instead of back in the alley where he dropped it because the light is better, I spent all those years hammering a nail with a screwdriver because…uh, the light was better.